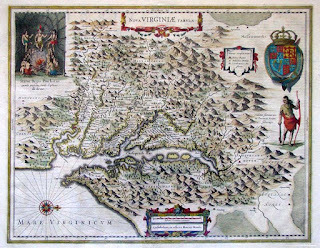 On March 12, 1612, King James I of England granted the following charter to the investors of the Virginia Company of London. It extends the colony's boundaries to include the islands of Bermuda and authorizes a lottery in order to raise funds. Some spelling has been modernized, contractions expanded, and paragraphs formed. [Encyclopedia of Virginia]. We, therefore, tendring the good and happy successe of the said plantacion both in respect of the generall weale of humane society as in respect of the good of our owne estate and kinge- domes, and being willing to give furtherannt untoall good meanes that may advannce the benefitt of the said Company and which maie secure the safety of our loving subjects, planted in our said Colony under the favour and proteccion of God Almighty and of our royall power and authority, have therefore of our especiall grace, certein knowledge and mere mocion, given, grannted and confirmed, and for us, our heires and successors we doe by theis presents, give, grannt and confirme unto the said Treasurer and Company of Adventurers and Planters of the said Citty of London for the First Colony in Virginia, and to their heires and successors for ever, all and singuler the said iselandes [whatsoever] scituat and being in anie part of the said ocean bordering upon the coast of our said First Colony in Vir-ginia and being within three hundred leagues of anie the partes hertofore grannted to the said Treasorer and Company in our said former lettres patents as aforesaid, and being within or be-tweene the one and fortie and thirty degrees of Northerly lati-tude, together with all and singuler [soils] landes, groundes, havens, ports, rivers, waters, fishinges, mines and mineralls, as-well royal mines of gold and silver as other mines and mineralls, perles, precious stones, quarries, and all and singuler other com- modities, jurisdiccions, royalties, priviledges, franchises and pre-heminences, both within the said tract of lande uppon the maine and allso within the said iselandes and seas adjoyning, whatso-ever, and thereunto or there abouts both by sea and land being or scituat; and which, by our lettres patents, we maie or cann grannt and in as ample manner and sort as we or anie our noble progenitors have heretofore grannted to anie person or persons or to anie Companie, bodie politique or corporate or to any ad-venturer or adventurers, undertaker or undertakers of anie dis-coveries, plantacions or traffique, of, in, or into anie foreigne parts whatsoever, and in as lardge and ample manner as if the same were herein particularly named, mencioned and expressed: pro-vided allwaies that the said iselandes or anie the premisses herein mencioned and by theis presents intended and meant to be grannted be not already actually possessed or inhabited by anie other Christian prince or estate, nor be within the bounds, limitts or territories of the Northerne Colonie, hertofore by us grannted to be planted by divers of our loving subjects in the northpartes of Virginia. To have and to hold, possesse and injoie all and singuler the said iselandes in the said ocean seas soe lying and bordering uppon the coast or coasts of the territories of the said First Colony in Virginia as aforesaid, with all and singuler the said soiles, landes and groundes and all and singular other the premisses heretofore by theis presents grannted, or mencioned to be grannted, to them, the said Treasurer and Companie of Adventurers and Planters of the Cittie of London for the First Colonie in Virginia, and to their heires, successors and assignes for ever, to the sole and proper use and behoofe of them, the said Treasurer and Companie and their heires, successores and as-signes for ever; to be holden of us, our heires and successors as of our mannor of Eastgreenwich, in free and common soccage and not in capite, yealding and paying therefore, to us, our heires and successors, the fifte part of the oare of all gold and silver which shalbe there gotten, had or obteined for all manner of services, whatsoever. And further our will and pleasure is, and we doe by theis presents grannt and confirme for the good and welfare of the said plantacion, and that posterity maie hereafter knowe whoe have adventured and not bin sparing of their purses in such a noble and generous accion for the generall good of theire cuntrie, and at the request and with the consent of the Companie afore said, that our trusty and welbeloved subjects. whoe since our said last lettres patent are become adventurers and have joined themselves with the former adventurers and planters of the said Companie and societie, shall from hence-forth be reputed, deemed and taken to be and shalbe brethren and free members of the Companie and shall and maie, respect-ively, and according to the proportion and value of their severall adventures, have, hold and enjoie all suche interest, right, title, priviledges, preheminences, liberties, franchises, immunities, profitts and commodities whatsoever in as lardge, ample and beneficiall manner to all intents, construccions and purposes as anie other adventures nominated and expressed in anie our former lettres patent, or anie of them have or maie have by force and vertue of theis presents, or anie our former lettres patent whatsoever. whome the said Treasurer and Companie have, since the said [last] lettres patent, nominated and sett downe as worthy and discreete persons fitt to serve us as Counsellors, to be of our Counsell for the said plantacion, shalbe reputed, deemed and taken as persons of our said Councell for the said First Colonie in such manner and sort to all intents and purposes as those whoe have bin formerly ellected and nominated as our Coun-sellors for that Colonie and whose names have bin or are incerted and expressed in our said former lettres patent. And we doe hereby ordaine and grannt by theis presents that the said Treasurer and Companie of Adventurers and Planters, aforesaid, shall and maie, once everie weeke or oftener at their pleasure, hold and keepe a court and assembly for the better ordening [ordering] and government of the said plantacion and such thinges as shall concerne the same; and that anie five per- sons of the said Counsell for the said First Collonie in Virginia, for the time being, of which Companie the Treasurer or his deputie allwaies to be one, and the nomber of fifteene others at the least of the generality of the said Companie assembled together in such court or assembly in such manner as is and hath bin heretofore used and accustomed, shalbe said, taken, held and reputed to be and shalbe a full and sufficient court of the said Companie for the handling, ordring and dispatching of all such casuall and particuler occurrences and accidentall mat-ters of lesse consequence and waight, as shall from time to time happen, touching and concerning the said plantacion. And that, nevertheles, for the handling, ordring and disposing of matters and affaires of great waight and importance and such as shall or maie in anie sort concerne the weale publike and generall good of the said Companie and plantacion as namely, the manner of government from time to time to be used, the ordring and disposing of the said possessions and the setling and establish-ing of a trade there, or such like, there shalbe held and kept everie yeare uppon the last Wednesdaie save one of Hillary, Easter, Trinity and Michaelmas termes, for ever, one great, generall and solemne assembly, which fower severall assemblies shalbe stiled and called The Fower Great and Generall Courts of the Counsell and Companie of Adventurers for Virginia; in all and every of which said great and generall Courts soe assem-bled our will and pleasure is and we doe, for us, our heires and successors forever, give and grannt to the said Treasurer and Companie and their successors for ever by theis presents, that they, the said Treasurer and Companie or the greater nomber of them soe assembled, shall and maie have full power and authoritie from time to time and att all times hereafter to ellect and choose discreet persons to be of our [said] Counsell for the said First Colonie in Virginia and to nominate and appoint such officers as theie shall thinke fitt and requisit for the government, managing, ordring and dispatching of the affaires of the said Companie; and shall likewise have full power and authority to ordaine and make such lawes and ordinances for the good and wellfare of the said plantacion as to them from time to time shalbe thought requisite and meete: soe allwaies as the same be not contrary to the lawes and statutes of this our realme of England; and shall in like manner have power and authority to expulse, disfranchise and putt out of and from their said Companie and societie for ever all and everie such person and persons as having either promised or subscribed their names to become adventurers to the said plantacion of the said First Colonie in Virginia, or having bin nominated for adventurers in theis or anie our lettres patent or having bin otherwise admitted and nominated to be of the said Companie, have nevertheles either not putt in anie adventure [at] all for and towards the said plantacion or els have refused and neglected, or shall refuse and neglect, to bringe in his or their adventure by word or writing promised within sixe monthes after the same shalbe soe payable and due. And wheras the failing and nonpaiment of such monies as have bin promised in adventure for the advanncement of the said plantacion hath bin often by experience found to be dann-gerous and prejudiciall to the same and much to have hindred the progresse and proceeding of the said plantacion; and for that itt seemeth to us a thing reasonable that such persons as by their handwriting have engaged themselves for the payment of their adventures, and afterwards neglecting their faith and promise, shold be compellable to make good and kepe the same; therefore our will and pleasure is that in anie suite or suites comenced or to be comenced in anie of our courts att Westminster, or els- where, by the said Treasurer and Companie or otherwise against anie such persons, that our judges for the time being both in our Court of Channcerie and at the common lawe doe favour and further the said suits soe farre forth as law and equitie will in anie wise suffer and permitt. And we doe, for us, our heires and successors, further give and grannt to the said Tresorer and Companie, and their successors for ever, that theie, the said Tresorer and Companie or the greater part of them for the time being, so in a full and generall court assembled as aforesaid shall and maie, from time to time and att all times hereafter, for ever, ellect, choose and permitt into their Company and society anie person or persons, as well straungers and aliens borne in anie part beyond the seas where-soever, being in amity with us, as our naturall liedge subjects borne in anie our realmes and dominions; and that all such per-sons soe elected, chosen and admitted to be of the said Companie as aforesaid shall thereuppon be taken, reputed and held and shalbe free members of the said Companie and shall have, hold and enjoie all and singuler freedoms, liberties, franchises, privi-ledges, immunities, benefitts, profitts and commodities, whatso-ever, to the said Companie in anie sort belonging or apperteining as fully, freely [and] amplie as anie other adventurer or ad-venturers now being, or which hereafter att anie time shalbe, of the said Companie, hath, have, shall, maie, might or ought to have or enjoy the same to all intents and purposes whatsoever. And we doe further of our speciall grace, certaine knowledge and mere mocion, for us, our heires and successors, give and grantt to the said Tresorer and Companie and their successors, for ever by theis present, that itt shalbe lawfull and free for them and their assignes att all and everie time and times here- after, out of anie our realmes and dominions whatsoever, to take, lead, carry and transport in and into the said voyage and for and towards the said plantacion of our said First Collonie in Virginia, all such and soe manie of our loving subjects or anie other straungers that will become our loving subjects and live under our allegiance as shall willingly accompanie them in the said voyage and plantacion; with shipping, armour, weapons, ordinannce, munition, powder, shott, victualls, and all manner of merchandizes and wares, and all manner of clothing, imple-ment, furniture, beasts, cattell, horses, mares, and all other thinges necessarie for the said plantacion and for their use and defence, and for trade with the people there and in passing and retourning to and froe, without paying or yealding anie subsedie, custome or imposicion, either inward or outward, or anie other dutie to us, our heires or successors, for the same, for the space of seven yeares from the date of theis present. And further, that itt shalbe likewise lawfull for the said Tresorer, or his deputy for the time, or anie twoe others of our said Counsell for the said First Colonie in Virginia, for the time being, from time to time and att all times hereafter, to minister such a formall oathe as by their discrescion shalbe reasonably devised, aswell unto anie person or persons imployed or to be imployed in, for, or touching the said plantacion for their honest, faithfull and just dischardge of their service in all such matters as shalbe committed unto them for the good and benefitt of the said Company, Colonie and plantacion; as alsoe unto such other person or persons as the said Treasurer or his deputie, with twoe others of the said Counsell, shall thinke meete for the examina-cion or clearing of the truith in anie cause whatsoever con-cerninge the said plantacion or anie business from thence proceeding or there unto proceeding or thereunto belonging. 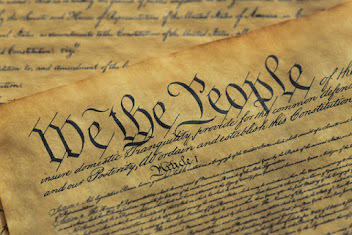 Now, for asmuch as it appeareth unto us that theis insolences, misdemeanors and abuses, not to be tollerated in anie civill government, have for the most part growne and proceeded in-regard of our Counsaile have not anie direct power and authoritie by anie expresse wordes in our former lettres patent to correct and chastise such offenders, we therefore, for the more speedy reformacion of soe greate and enormous abuses and misdemeanors heretofore practised and committed, and for the preventing of the like hereafter, doe by theis present for us, our heires and successors, give and grannt to the said Treasurer and Companie, and their successors for ever, that itt shall and maie be lawfull for our said Councell for the said First Colonie in Virginia or anie twoe of them, whereof the said Tresorer or his deputie for the time being to be allwaies one by warrant under their handes to send for, or cause to be apprehended, all and every such person and persons who shalbe noted or accused or found, att anie time or times here after, to offend or misbehave themselves in anie the offences before mencioned and expressed; and uppon the examinacion of anie such offender or offendors and just proofe made by oath taken before the Counsaile of anie such notorious misdemeanors by them committed as aforesaid; and allsoe uppon anie insolent, contemptuous or unreverent carriage and misbehavior to or against our said Counsell shewed or used by anie such person or persons soe called, convented and apear-ing before them as aforesaid; that in all such cases theie, our said Counsell or anie twoe of them for the time being, shall and maie have full power and authoritie either here tO binde them over with good suerties for their good behaviour and further therein to proceed to all intents and purposes, as itt is used in other like cases within our realme of England; or ells att their discrescion to remannd and send back the said offenders or anie of them unto the said Colonie in Virginia, there to be proceeded against and punished as the Governor, deputie and Counsell there for the time being shall thinke meete; or other- wise, according to such lawes and ordinannces as are or shalbe in use there for the well ordring and good governement of the said Colonie. And, for the more effectuall advanncing of the said plantacion, we doe further, for us, our heires and successors, of our especiall grace and favour, by vertue of our prorogative royall and by the assent and consent of the Lordes and others of our Privie Coun-salle, give and grannte unto the said Tresorer and Companie full power and authoritie, free leave, libertie and licence to sett forth, errect and publishe one or more lotterie or lotteries to have continuance and to [endure] and be held for the space of one whole yeare next after the opening of the same, and after the end and expiracion of the said terme the said lotterie or lotteries to continue and be further kept, during our will and pleasure onely and not otherwise. And yet, nevertheles, we are contented and pleased, for the good and wellfare of the said plantacion, that the said Tresorer and Companie shall, for the dispatch and finishing of the said lotterie or lotteries, have six months warn-inge after the said yeare ended before our will and pleasure shall, for and on that behalfe, be construed, deemed and adjudged to be in anie wise altered and determined. And our further will and pleasure is that the said lottery or lottaries shall and maie be opened and held within our cittie of London or in anie other cittie or citties, or ellswheare within this our realme of England, with such prises, articles, condicions and limitacions as to them, the said Tresorer and Companie, in their discreascions shall seeme convenient. And that itt shall and may be lawfull to and for the said Tresorer and Companie to ellect and choose receivors, auditors, surveyors, comissioners, or anie other officers whatsoever, att their will and pleasure for the better marshalling and guiding and governing of the said lottarie or lottaryes; and that itt shalbe likewise lawfull to and for the said Tresorer and anie twoe of the said Counsell to minister unto all and everie such persons soe ellected and chosen for officers as aforesaid one or more oathes for their good behaviour, just and true dealing in and about the lottarie or lottaries to the intent and purpose that none of our loving subjects, putting in their monies or otherwise adventuring in the said generall lotterie or lottaries, maie be in anie wise defrauded and deceived of their said monies or evill and in-directlie dealt withall in their said adventures. And we further grannt in manner and forme aforesaid, that itt shall and maie be lawfull to and for the said Treasurer and Companie, under the seale of our Counsell for the plantacion, to publishe or to cause and procure to be published by proclama-cion or otherwise, the said proclamacion to be made in their name by vertue of theise present, the said lottarie or lotteries in all citties, townes, boroughts, throughfaires and other places within our said realme of England; and we will and commande all mayors, justices of peace, sheriffs, bayliffs, constables and other our officers and loving subjects whatsoever, that in noe wise theie hinder or delaie the progresse and proceeding of the said lottarie or lottaries but be therein and, touching the premisses, aiding and assisting by all honest, good and lawfull meanes and endevours. And further our will and pleasure is that in all questions and dobts that shall arise uppon anie difficultie of construccion or interpretacion of anie thing conteined in theis or anie other our former lettres patent the same shalbe taken and interpreted in most ample and beneficiall manner for the said Tresorer and Companie and their successors and everie member there of. Per breve de privato sigillo, etc. 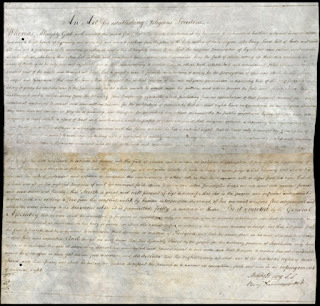 View original Third Charter of Virginia.